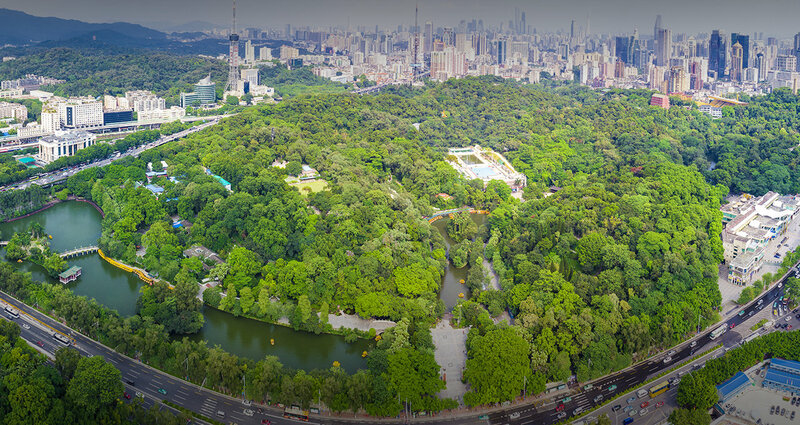 Guangzhou is a famous culture city and a splendid tourism city with a history of more than 2,200 years and a homeland of overseas Chinese as well. It enjoys the name of “Flower City” as the superb geographic and climatic conditions in the South contributed to the natural beauty here. As a city of heroes, Guangzhou has a reputation of great eminence in the modern history of China. The historical sites of Sun Yat-sen Memorial Hall, Huanghuagang 72 Martyr Cemetery, Guangzhou Luxun Memorial Hall, Peasant Movement Institute, Sanyuanli Anti-British Invasion, and the Former Site of Huangpu Military Academy are the witnesses of the modern history of China, and, together with Baiyun Mountain, Yuexiu Park, Liuhuahu Park, Lu Lake and South-China, constitute colorful landscape groups. Meanwhile, Guangzhou was the starting point of the “Maritime Silk Road” and is an important port city for the opening and reform of China, making great contribution to the economic and cultural exchange and friendly contacts between China and the rest of the world and demonstrating everlasting prosperity. 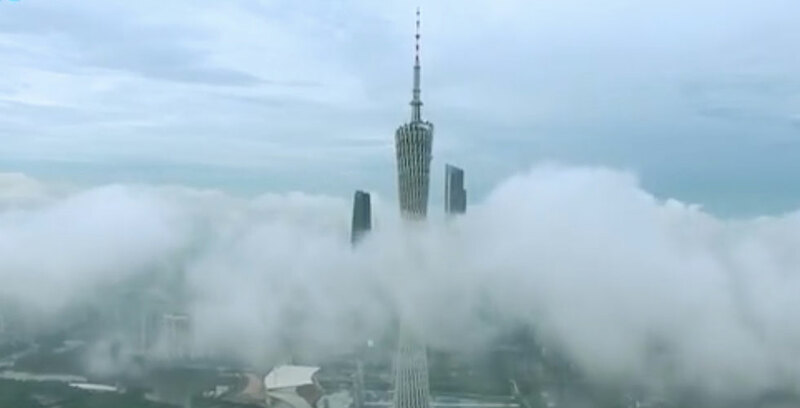 Canton Tower is located at an intersection of Guangzhou New City Central Axes and Pearl River, directly facing Haixinsha Island where the opening and closing ceremonies of the Sixteenth Asian Games were held and the 21st century new city CBD of Guangzhou-Zhujiang New Town. With its unique shape and design, Canton Tower has become a magnificent landmark on the New City Central Axes, adding beauty and charm to the Pearl River. There is one smaller rotating ellipse at the top twisting up counterclockwise with the other larger rotating ellipse at the bottom, which creates a “slim waist” in the middle and makes it look like a lady looking behind. Canton Tower is not only a comprehensive sightseeing building with rich cultural connotation but also a world-famous tourist spot integrated with the multi-functions of Sightseeing, F&B, Adventure, 4D Cinema, Wedding, MICE, Science and Technology, Education, and Shopping prosperity. Guangzhou’s Five Rams Sculpture is located atop Yuexiu Hill. It was built in 1960 from more than 130 pieces of granite and is one of the city’s emblems. The sculpture represents the five rams who gave Guangzhou its nickname “City of Rams” and were formerly honored at its Temple of the Five Immortals. These immortals were said to have ridden rams into the city soon after its founding, teaching its residents how to grow rice and ending the specter of famine forever. Locals consider the rams symbols of good luck. Also atop Yuexiu Hill is the Five-storied Pagoda now known as Chen Hoi Lau. The present structure is 28 meters (92 ft) high and 16 meters (52 ft) wide. It has housed the Guangzhou Museum since it was opened to the public in 1928. A guard tower was first erected at the site in 1380, one of the first to be constructed in Lingnan. Chinese legend holds that Zhu Liangzu (朱亮祖), Marquis of Yongjia and a member of the Ming dynasty, saw yellow and purple air rising over Yuexiu and was told that it was the sign of a new emperor. He then erected the tower as part of the city walls to alter the mountain’s feng shui and prevent the prophecy from coming to pass. It has been destroyed and rebuilt five times, the various towers appearing in Chinese poetry and art. Yuexiu Stadium was refreshed from the old Yut Sau Shan Park Playground at the foot of the hill in 1950 at the behest of Mayor Ye Jianying. It covers an area of 43,000 square meters (462,848 sq ft). It was one of the Asian Games venues in 2010. The stadium is not only a sports activity site, but also a large-scale concert hall. Since its opening in October 1950, it has held 200 meetings and more than 280 performances. It can hold 35,000 people. The Pavilion of Regaining is a square pavilion erected in 1948 on the spot of an earlier 1928 memorial to the Xinhai Revolution against the Qing Empire. The first pavilion was destroyed amid fighting with the Japanese during World War II. The Sun Yat-sen or Zhongshan Memorial Hall is an octagon-shaped building in Guangzhou, capital of China’s Guangdong Province. The hall was designed by Lu Yanzhi and was built with funds raised by local and overseas Chinese people in memory of Sun Yat-sen. Construction work commenced in 1929 and completed in 1931. The hall is a large octagonal structure with a span of 71 meters without pillars, housing a large stage and seats 3,240 people. The memorial hall stands on the site of Guangzhou’s Presidential Palace during the Constitutional Protection Movement, when the Nationalists operated a rival “Chinese” government to the Zhili Clique’s Beijing regime. The palace was damaged during Ye Ju’s 16 June 1922 attack on Sun Yat-sen, during which—though he had already fled—his wife narrowly escaped shelling and rifle fire before meeting him on the gunboat Yongfeng, where they were joined by Chiang Kai-shek. The hall itself has been severely damaged and repaired several times until 1998, when it was comprehensively upgraded to its present-day condition. A statue of Sun Yat-sen was erected in front of the main entrance. Locating at the Yuexiu Park, Guangzhou, Zhenhai Tower is a comprehensive history museum with dense Canton characteristics. The tower is one of historic sites in Guangzhou as it is established in 1929. Now, it is used for collection and exhibition of historical data and cultural relics of the city. The museum consists of two parts: the Zhenhai Tower that houses the historical relics and the Art Gallery that exhibits many exquisite local art works. Ersha Island is an island in the middle of the Pearl River. Encircled by the Pearl River, the island enjoys picturesque landscape different from the downtown. After the establishment of China, it has been the training base for provincial athletes and an ideal place for exquisite resident houses 80% of which are said to be owned by foreigners. Covered by modern apartments, and art places like Xinghai Concert Hall and Guangdong Museum of Art, the island is given a sense of art. The square in the new central shaft line of Guangzhou has been officially named as “Huacheng Square”. It is regarded as “Guangzhou’s parlor” and is the largest square for civilian purpose in Guangzhou. 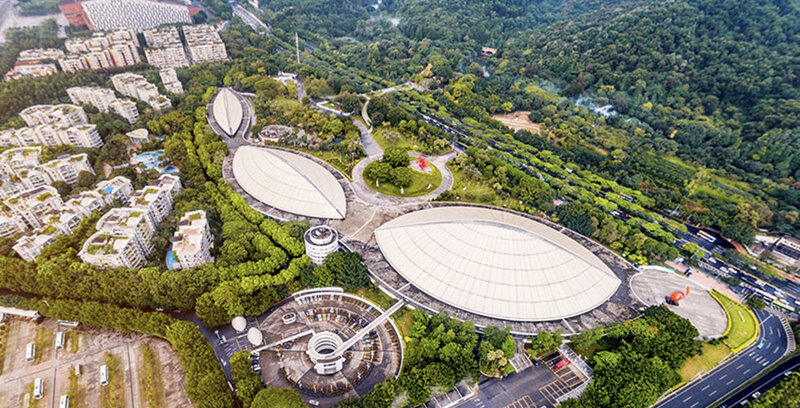 The Square is surrounded by 39 buildings, including the Guangzhou No.2 Children’s Palace, the Guangzhou Opera House, Guangzhou Library, Guangdong Museum and the West Tower (Guangzhou International Financial Center (GZIFC)), etc. In the Square, there are a man-made lake & landscape district as well as large-scaled fountains, lamplight piazza, system for formation of cold fog and temperature drop, over 600 trees and 5 flower islands. Underneath Huacheng Square is a 150,000 square-meter high-end underground shopping mall, the “Mall of the World”. Shameen Island is a sandbank island in the Liwan District of Guangzhou city, Guangdong province, China. The island’s name literally means “sandy surface” in Chinese. The territory was divided into two concessions given to France and the United Kingdom by the Qing government in the 19th century. The island is a gazetted historical area that serves as a tranquil reminder of the colonial European period, with quiet pedestrian avenues flanked by trees and lined by historical buildings in various states of upkeep. The island is the location of several hotels, a youth hostel, restaurants and tourist shops selling curios and souvenirs. Shameen Island was an important port for Guangzhou’s foreign trade from the Song to the Qing Dynasty. From the 18th to the mid 19th century, the foreigners lived and did business in a row of houses known as the Thirteen Factories, on the banks of the Pearl River to the east the present Shameen, which was then an anchorage for thousands of boat people. Shameen became a strategic point for city defense during the period of the First and Second Opium Wars. In 1859,the territory was divided in two concessions given to France and the United Kingdom (of which 3/5 belonged to the British and 2/5 to the French). It was connected to the mainland by two bridges, which were closed at 10pm as a security measure. The British arch bridge, also called the “Bridge of England” and built in 1861, to the north was guarded by Sikh police officers, and the French bridge to the east was guarded by Vietnamese (Cochinchina) recruits with the Troupes coloniales.Trading companies from Britain, the United States, France, Holland, Italy,Germany, Portugal, and Japan built stone mansions along the waterfront. The construction on the island was characterized by climate-adapted but Western-plan detached houses with hipped roofs and large verandahs.The island was the scene of fighting during the “June 23 incident” in 1925.After 1949, the mansions of Shameeni became government offices or apartment houses and the churches were turned into factories. Lychee Bay or Litchi Bay, a set of creeks and lakes that flow southwest to Pearl River, is a tourist attraction in Guangzhou (Canton), Guangdong. Liwan District, where Lychee Bay is located, was named after it. There are many historical relics and historical architectures in Lychee Bay, such as Wenta and Xiguan House. Various cultural activities are held on Lychee Bay, such as the competition of Cantonese opera.